Buffalo is a big city with a hometown feel. 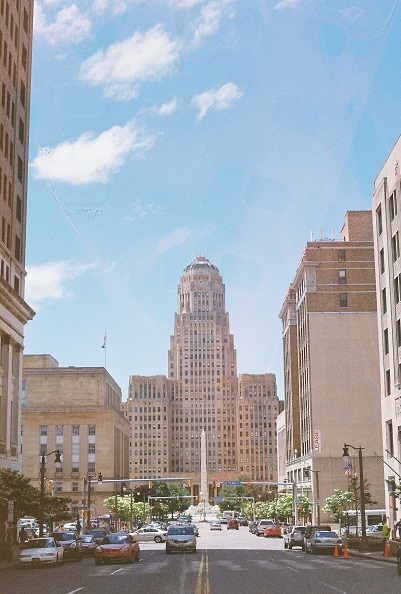 Located in the Buffalo-Niagara region of New York State, Buffalo is in a period of revitalization in a region that offers a world of opportunity. Find out about unique group housing opportunities for Fellows and other elements that make Buffalo such a great place to spend a summer. Coordinated group housing is a unique component of the High Road Program. Traditionally two options are offered: one is a more conventional student-housing option, and the other is a neighborhood housing option where students live in community with many of the people their placements serve. 2012 Fellows split time between a local college dorm and then moved into a house in the Elmwood Village neighborhood. 2011 Fellows lived in Buffalo's first energy-neutral Net Zero house on the West Side, part of PUSH Buffalo's Green Development Zone. High Road partner organizations are focused on revitalizing Buffalo. Each of the placements associated with the program are determined in tackling Rust Belt challenges like urban revitalization, quality job creation, the green economy, and small business development. High Road fellows have and continue to make immense and lasting contributions to the fabric of these organizations. High Roaders have made a significant and lasting impact on the Buffalo community. The High Road Record illustrates not only the students' summer contributions to Buffalo's revitalization, but also the great diversity of community organizations that are committed to service learning and applied research opportunities for young people. Buffalo is a culturally rich city and has lots of different types of experiences to offer such as museums, historic architecture, theater, music, festivals, food, and sporting events. Every Friday the students as a group are immersed in the city life of Buffalo, with neighborhood walking tours, field trips and cultural experiences; meetings guest experts and civic leaders; and sharing their weekly journals, project experiences and research. Fellows are immersed Buffalo life beyond their placements. Friday programs include forums with guest experts on specific local economic development issues; sharing students’ weekly journals, project experiences and research; participating in field trips; and contributing to the programs and information infrastructure of the Partnership for the Public Good. Other activities include networking with Cornell alumni, special events and free time to explore together as a group or as individuals.